Northbound Route 53 ramp from westbound Palatine Road closed by Arlington Heights police. A mixture of freezing rain and snow caused extremely slick conditions on Route 53, main arteries and side streets. Multiple crashes between 7:30 and 8:30 p.m. Monday on Route 53 and Palatine Road. Crashes continued mostly on arteries and side streets after 8:30 p.m.
Palatine firefighter/paramedics first responded to a crash on Route 53 southbound entrance ramp from Dundee Road. The crash involved the rollover of a pickup truck. Schaumburg Fire Department firefighter/paramedics and Rolling Meadows firefighter/paramedics responded between 7:45 p.m. and 8:00 p.m. to Route 53, just north of Interstate 90. Abhijit Anturkar, 35, of the 300 block of West Meadow Mist Lane in Round Lake was killed in an accident on Route 53 near I-90 about 7:45 p.m. Monday. Anturkar was standing outside his vehicle near the center median of northbound Route 53 inspecting damage to his vehicle after sliding off the expressway, when his car was hit from behind by another vehicle that was in a spinout. His own car struck him and flipped him over into the southbound lanes, where a vehicle traveling southbound hit him. Abhijit Anturkar died from his injuries sustained on Route 53, according to the Cook County Medical Examiner. Video from Route 53 as it was closed after freezing rain and snow cause multiple crashes and spinouts. Firefighter skating in fire boots at 7:34 elapsed time and following. At northbound 53 north of Rand Road, a Cadillac SUV rolled over. At Arlington Heights Road and Northwest Point Boulevard — a crash with no injuries. Elk Grove Village Fire Department responded to northbound 53 at Biesterfield — a crash with two cars in the center lane. Elk Grove Village Fire Department responded to northbound 53 at Biesterfield — a spinout into the ditch. Elk Grove Village Fire Department responded to another crash at northbound 53 at Biesterfield — red Honda CRV hit the median wall. Elk Grove Village Fire Department responded to one car into the wall on northbound Route 53 just south of Thorndale — no injuries. Elk Grove Village Fire Department witnessed a crash of two cars and a semi-trailer truck on southbound Route 53 halfway between Thorndale Avenue and Irving Park Road. Elk Grove Village Fire Department responded to two one-car crashes involving the center median barrier — one in the southbound lanes and one in the northbound lanes. Mount Prospect responded to a car that hit a pole at Elmhurst and Pine — no injuries. Prospect Heights police and firefighter/paramedics responded to a rollover crash with injuries at Palatine Road, just east of Wolf Road. Police reported a car on its roof. Prospect Heights police and firefighter/paramedics also responded to a crash with injuries that brought down a light pole at Palatine Road near Schoenbeck Road. Arlington Heights police assisted with the Palatine-Schoenbeck crash. Arlington Heights firefighter/paramedics also assisted Prospect Heights with a crash at Elmhurst Road and Willow Road in Prospect Heights. Front of the line when northbound Route 53 was shut down. Prospect Heights police also reported about seven cars crashed on Palatine Road near the end of the runway at Chicago Executive Airport. About 8:50 p.m. Prospect Heights police request Palatine Road shut down from Wheeling Road in both directions to Saunders Road. Wheeling police blocked eastbound Palatine Road at Wheeling Road. Northbrook police blocked westbound Palatine Rd at Saunders Road. A pedestrian was also hit by a car about 9:00 p.m. at Palatine Road and Old Palatine Road south of Chicago Executive Airport. Ten cars spun off to the side on Route 53. Several cars hit the center barrier. Car versus a light pole northbound Route 53 north of Palatine Road. Car versus a light pole southbound onramp to Route 53 from Dundee Road — second crash on the onramp. Car versus light pole on the southbound onramp to Route 53 from Palatine Road — lightpole blocking the ramp, and firefighters moved it. Car versus lightpole on the southbound onramp to Route 53 from Lake Cook Road — light pole blocking roadway, and firefighters moved it. Taxi spun out on southbound Route 53, just south of Palatine Road. Minivan hit the wall southbound Route 53 just north of Palatine Road. Westbound Thorndale at Route 53 — a crash. Four car crash northbound 53, just south of Rand Road. Southbound 53 near Rand Road — a Ford Explorer hit the wall with airbag deployment. Police and firefighters shut down Route 53 at about 8:10 p.m. Fire vehicles were also shutting down entrances to southbound 53 from Dundee Road and southbound Route 53 from Lake Cook Road. Later Arlington Heights police shut the Palatine Road entrance ramp to northbound Route 53 and the northbound entrance ramp to Euclid Avenue. Police later put down flares to cover all of the interchanges. Arlington Heights public works also placed barricades at ramps. 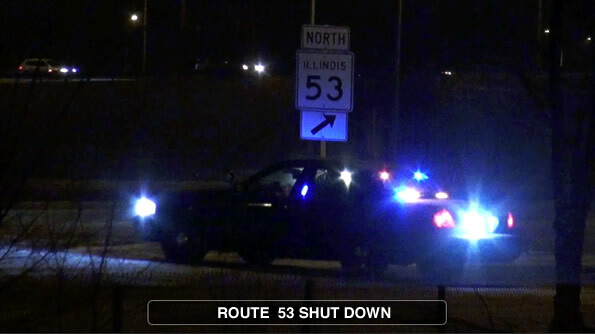 Palatine police and Rolling Meadows police were working similar actions on the west side ramps of Route 53. Arlington Heights police also dropped flares at Northwest Highway ramps to Route 53. Eventually Route 53 was closed in both directions from Lake Cook Road to Interstate 90 after emergency personnel were witnessing crashes happening around them while they were managing other crashes. The Illinois State Police activated its emergency weather plan (known by some as the accident plan) and responded only to crashes involving a personal injury, crash-disabled vehicle, or a disabled vehicle with lane blockage. Drivers who crashed were advised to exchange information with each other and report the crash to police Tuesday. Later Arlington Heights, Buffalo Grove police and other police departments remained busy with accidents on village and city streets across Cook County and Lake County. A Ford Focus and a Lexus crashed near the Mobil station at 1880 South Arlington Heights Road. Mazda and Honda crashed on the 200 block of North McHenry Rd. — no injuries. Dodge Ram and Scion crashed at Algonquin Rd and Tonne — no injuries.